As a marketer, it can be difficult to keep track of the seemingly daily changes that are made to Google’s search results algorithms. It wasn’t too long ago that everyone would celebrate when a particular piece of content ranked in spot number one. Now, ranking is getting harder and harder. 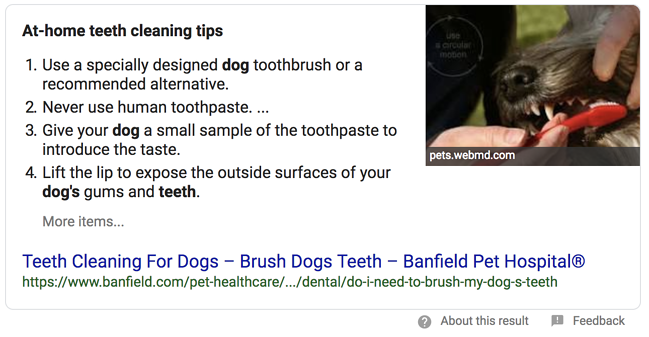 In this article, we will cover how to optimize your content to rank for featured snippets—otherwise known as position zero—in Google. A featured snippet is a quick, snapshot answer to a search query that populates directly on Google’s SERP (Search Engine Results Page). The purpose of this is to answer searcher’s questions at a glance. 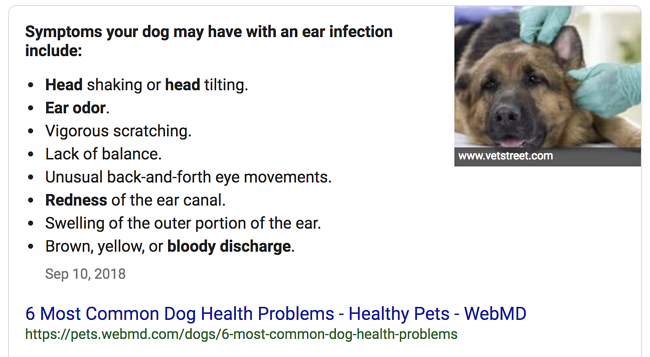 Why should I care about ranking for featured snippets? For a while, there was a concern that ranking for a featured snippet would steal traffic away from your website. After all, if the answer to a question is already populated, why would anyone click through into your site? Sometimes, the snippet is simply enough for someone to find the information they're looking for. If you rank for both the organic result AND the featured snippet, your result can generate 28.2% of all clicks. The competitive advantage for inbound traffic is hard to argue with. And as searchers become more familiar with using snippets, your chances of ranking and obtaining qualified traffic can only go up. What kind of content ranks for featured snippets? Read on for the scoop, as well as a few examples and best practice tips for optimizing your content! Ranking for a Paragraph Snippet: Think of a keyword you’re trying to rank for. Then, use a tool like Answer the Public to find out how people are forming this keyword into questions. In a new blog post—or better yet, one that’s already ranking for this term—write out these questions and answer them in a concise, easy-to-understand, summary paragraph. Just because someone already scored the paragraph snippet doesn’t mean you can’t ‘steal’ it. Think of a better way to answer that individual’s question, and write something that answers it more fully or concisely. Numbered lists can also appear in snippets to fully answer a question, introduce the searcher to the steps required to carry out a process, etc. Note that, depending on the length of the article or the number of steps involved, Google may only populate the first few in the snippet. The blog post goes on to explain each of these steps in detail. But this called-out, crawlable section draws immediate attention of both humans and bots with respect to what the meat of this post is. Adding a header that contains the most popular search query can also boost your chances of ranking. 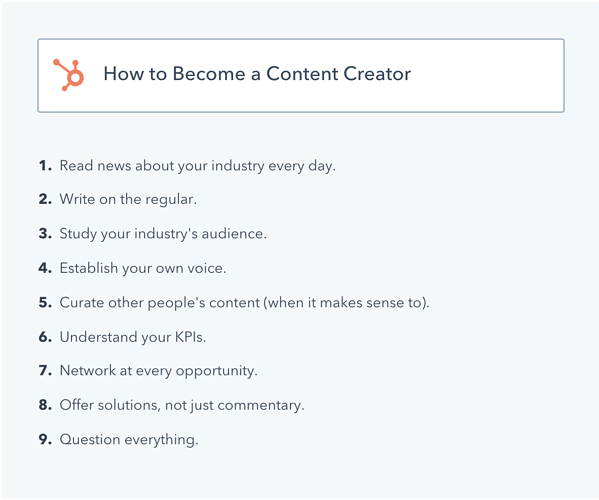 Instead of “here are nine creative steps to becoming the content creator of your dreams”, they lead this with the most common query: “how to become a content creator”. Sometimes, keeping it simple is key. Bulleted lists are used to give a list of answers that don’t need to appear in any particular order. Again, the list may not appear in full, depending on the length of the article or number of results. Or basically anything that is bundled together in a non-specific order. Ranking for a Bulleted List Snippet: Similar to how you'd optimize content for a numbered list snippet, formatting your post as a bulleted list is key to ranking here. It’s also important to keep your header intro simple and to-the-point. If your content isn’t ranking for a bulleted snippet, try changing up your header to a different search query. Or, try adding more bullets, more detail, or boosting traffic to your post through social media, email marketing, or paid advertising. Tables are used to show an aggregate of data in an easily digestible format. The information is usually formatted as a table on the original site and re-formatted as a table in Google. The result may only show a portion of the table, especially if the search query is targeted. Ranking for Table Snippets: If you want your content to appear in that area, your content must first be formatted as a table. And the table must be readable by bots. Using an image or screenshot from Excel won’t work. Not yet, anyway. (However, that image could rank for an image result!) Tables are becoming more and more popular, especially for formulas, product comparisons, and pricing. If tables apply to your niche market, make sure you format your tables in a way that is easy for humans to read when they get to your site, and easy for Google to recreate in the results pages. 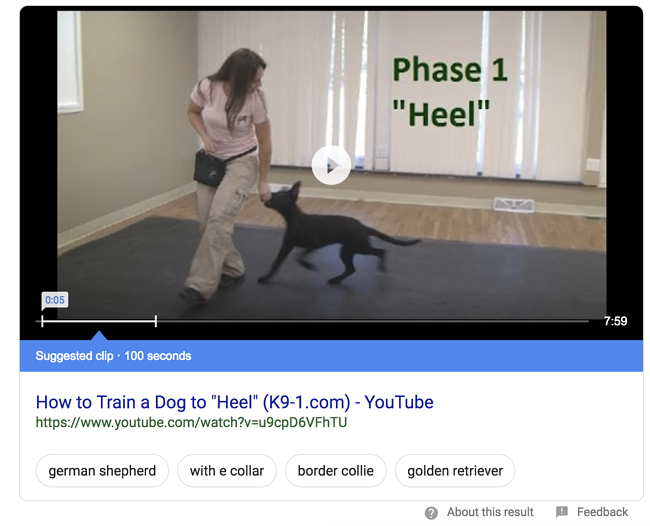 Due to the amount of search results that often yield video-based results, there's been a dramatic increase in video snippets appearing in Google SERPs. In a video snippet, a portion of a YouTube video is segmented to give searchers the answer to their question quickly, without having to watch an entire video. Sometimes the clip is only a few seconds of a video that is several minutes long. This type of video can answer any kind of question, but usually answer how-to or what-is questions. Ranking for a Video Snippet: Contrary to what you might think, you don’t need to create a new video to rank for a video snippet. If your video shows a process, how-to, or a series of steps, you could already be on the right track. This is a really great post about how to optimize videos for snippets. However, everyone agrees that submitting a transcript is a great place to start. This can draw attention to sections of your video that get right to the point. 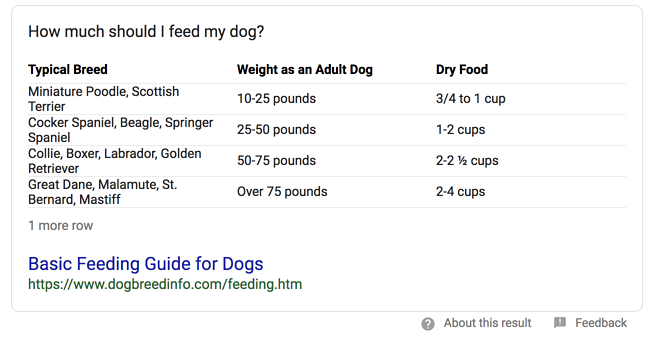 This is a relatively new way to rank in featured snippets but it’s gaining traction quickly. Carousels are buttons that appear under other snippets that suggest related terms. This allows the visitor to easily click through related search terms without needing to research or leave the SERP. This type of engagement is an important opportunity for you. Because it means your content can rank on a search result page for a completely different search term. 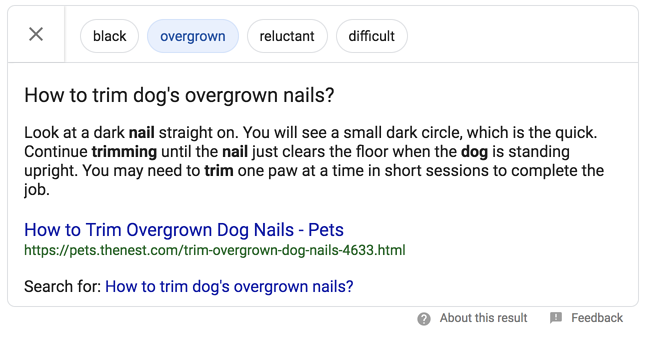 You’ll notice that Google offers me the option to conduct a second search for “how to trim dog’s overgrown nails” next, again without me having to type anything else. Ranking for Carousel Snippets: First, see what content is already ranking for the topic you're after. Then, think of ways you can contribute value to this topic. If “how to trim overgrown nails” is ranking, write something about “how to know if your dog’s nails are overgrown”. It’s similar, but different enough to answer an additional question for this searcher. Have more questions about content optimization? Leave them in the comments below or simply contact our team. We're happy to help! 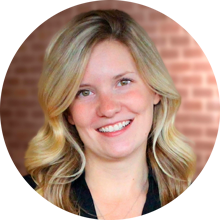 Kate Moore is a Content Marketer by day, HubSpot expert by night. When she’s not getting distracted by her many fans (ahem – work emails and phone calls), she’s hunkered down, plugged into Spotify and writing about stuff that will make your work with HubSpot smooth and simple.